Showman TEAL Glitter Overlay MEDIUM OIL Leather Wither Strap! NEW HORSE TACK! 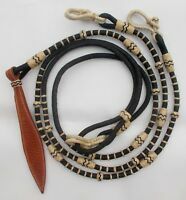 Showman Navajo Beaded Inlay MEDIUM OIL Leather Wither Strap! NEW HORSE TACK! I will ship within 3 working days of payment receipt. International Buyers: Please note that USPS First Class and Flat Rate Priority International shipments cannot be tracked or traced if lost, therefore, USPS Priority International Mail based on package weight is recommended.